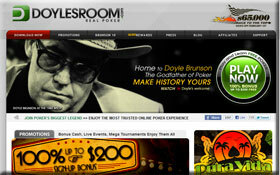 When rumors of the potential split between the Cake Poker Network and one of the networks’ most popular online poker rooms, Doyles Room, first circulated last week most of us were focused on just where Doyles Room would land. When Doyle Brunson tweeted that he was in Costa Rica one of the more intriguing possibilities involved Doyles Room joining the Cereus Poker Network of Absolute Poker and UB Poker –as the network is located in Costa Rica. However, Cereus is not the only poker network that calls Costa Rica home, and it was another, smaller, network that landed Doyles Room. The very small Yatahay Poker Network, best known for being the home of True Poker, ended up inking the deal and adding Doyles Room to their roster. While the traffic numbers for Yatahay are not in yet, the Cake Poker Network saw a nearly 30% drop in traffic after Doyles Room left according to pokerscout.com. A look inside the numbers shows that the average number of players dropped by about 400 at the Cake Poker Network. With an addition of some 400 cash-game players to their average of less than 100, the Yatahay Poker Network could be one of the biggest gainers in the online poker world in 2011 –especially when you consider that increased traffic usually attracts more traffic. The Cake Poker Network, once a major player in the online poker market, has been in steady decline over the last year or so, having lost a number of poker rooms, faced a security issue, and more recently having parted ways with top executives Lee Jones and Serge Ravitch. It will be interesting to see what changes the Cake Poker Network makes to try to recover in 2011. Is it RIP Doyles Room or RIP Cake network? This entry was posted on Monday, January 31st, 2011 at 8:36 am and is filed under Poker News. You can follow any responses to this entry through the RSS 2.0 feed. You can leave a response, or trackback from your own site.